A nice thing about LoRa is that the receiver needs very very little processor power - even a lowly PIC or AVR has plenty enough power to do the job - because the hard work is done inside the LoRa chip. However, having received the data it would be good to upload it to the internet so that others can follow the flight on a map, and/or view the pretty pictures being received, and for this a Raspberry Pi is ideal. The LoRa board is exactly the same as used by the tracker. 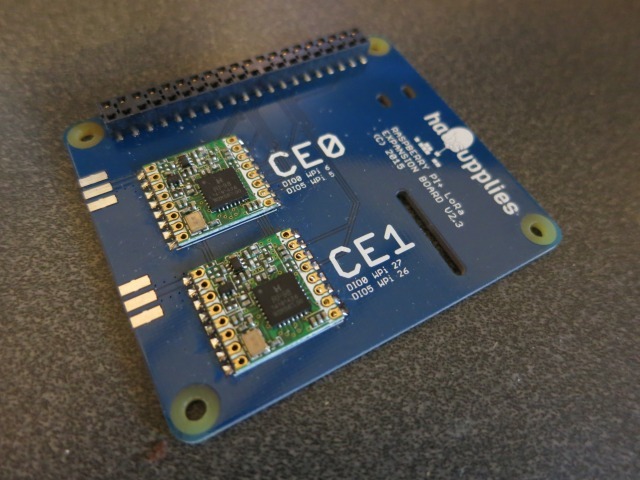 The above board is populated with 2 LoRa modules, so it can be used to listen on 2 separate frequencies at the same time. Our software supports the use of 1 or 2 modules, and either can be 434 or 868 MHz versions. Physically install is very simple – just push on to the Pi using a standard pin header extender (supplied). Or a pin header with extended pins can be used if you want to stack another board on top. Next, burn an operating system onto a suitable SD card. For this purpose anything from 4GB should be fine. The following instructions are for Raspbian, and no other operating systems have been tested. Then expand the filesystem, as you would normally do, then choose Advanced Options –> SPI and enable SPI. It’s also worthwhile to change the hostname (Advanced Options –> Hostname) to something like "LoRaGateway". Finally, close the program and agree to reboot the Pi. This firstly sets your callsign, which if you are a radio amateur would normally be your radio callsign, but it can be something else. The next part sets the frequency and mode for the first LoRa device (the one in position “CE0”). Frequency is in MHz and should match the frequency of the tracker that you intend to receive. For full details on all settings see the README.md file in the /github repository.